Two traits of spring, a strong breeze and cold water, make the season the perfect time to target walleyes using slip bobbers. Nothing ignites the action of bait below a slip bobber more than wind-driven waves on the surface, and a stiff southerly breeze common early in the year helps concentrate fish on structure. Add to that the fact walleyes in cold water will bite, but not chase, and it's clear why slip bobbers that suspend a bait in front of a hungry walleye will outpace other faster presentations. A third factor also should make up your mind to reach for slip bobbers in April and May. Walleyes are often shallow early in the season. Though slip bobbers are great tools for deep water, they shine when fish are in water less than 10 feet deep. Temperature is key to locating active walleyes early in the year. Lakes of 500 acres or so, especially those with dark bottoms, will warm first. Walleyes there could be spawned out while walleyes in mid-sized lakes or larger lakes are in pre-spawn mode or spawning. Walleyes lay eggs from 42 degrees to about 48 degrees. Once water reaches 50 degrees, slip bobbers are killer. Choose lakes where walleyes have just finished spawning, which should offer the chance to catch both male and larger female fish. Temperature continues to play a critical role once you've targeted a specific lake. Even if water is only slightly warmer than the surrounding area, walleyes will find it. A difference of just a couple of degrees can mean the difference between no fish and fish. Remember, too, temperature on a body of water can swing significantly in spring during the course of a day. The coat you wore at sunrise is off by 10 a.m. Preferred location can change just as dramatically. Some anglers might think the fish quit biting. But, they simply moved. Structures that offer hard bottoms, including shoreline points, islands and mid-lake rock structures, are likely to hold the most walleyes. The best points offer rocks, newly emerging weeds or wood. One stump may hold many fish, and it will day after day. Islands with gravel bases deserve extra attention. Mid-lake rocky structures are great, too, if they're shallow enough to allow the sun to warm them. Sand bars with fingers and bays with sandy bottoms are also tremendous fish attractors. They may look too clean, too featureless, to hold walleyes, but they do. With flat bottoms and depths of 10 feet or less, they're perfect to attack with slip bobber rigs. The best structures will be the ones where the wind is pounding the hardest because warm surface water will be blown there. Don't be afraid to change lakes in the course of a day, too. Fish might be shallow early in a clear water lake, then move off to deeper water where they are harder to catch as the sun rises. If that happens, pick a darker, stained-water lake for mid-day action. Boat traffic is another consideration. 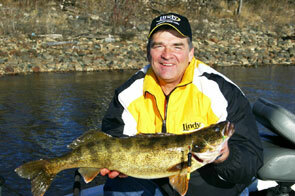 Walleyes are skittish at this time of year, so fishing busy places can reduce your odds in a hurry. Try to stay off the beaten path. Slip bobbers have a drawback. They can be a very slow way to find fish. Try using a jig to locate "Judas" fish, the active ones that bite faster presentations. They give away the location of the school. Once you know where the fish are, slow down with slip bobbers, a presentation more in tune with the overall mood of the walleyes in colder water. The basic slip bobber rig includes a thread bobber stop, a glass bead, a slip bobber, a Lindy NO-SNAGG barrel swivel, a leader of line lighter than the main line and a hook or jig. Best slip bobbers for springtime conditions are weighted to let you cast into the wind. That lets the breeze work for you by blowing the slip bobber back to the boat and beyond to cover a larger area searching for fish. There are lots of floats on the market, but stick with ones that are painted and visible. One good choice is the new Thill Pro Series. The large is PSW 115, the medium is PSW 110. The weight is removable. Or, if you prefer non-weighted models, the PS 115 is the large and the LS 110 is the medium. The Gold Medal Supreme Super Shy Bite (IM 201) is another great choice. They have easy-on, easy-off capability to adjust the size of the float to meet changing conditions in wind, depth or the distance you want to reach. The Float-Hi 783W in pink or orange is a highly visible foam float. Choose a float one size larger than you think you'll need. The primary bait you'll be using is a redtail chub, a sucker or a fathead minnow. A three can pull small floats down, giving false hope of a strike. Always take at least two bait choices along. One of the trio may be the primary forage of a lake or walleyes may just prefer one over the other two on a given day. It can be a long day if you don't have the right one along. Gold hooks seem to work best early in the year. Use a number 4 or number 6 Mustad Aberdeen for fatheads. Switch to a bleeding red Tru-Turn in a number 4 or number 2 for larger chubs. Add a red glass bead and a small 0 or 00 Colorado or Indiana blade on a clevis above the hook. When you are drifting or the minnow swims, the blade gives off a flash that walleyes like. A silver blade is best in clear water, a gold blade is best in stained or darker water. Hook the bait between the dorsal fin and the tail. It must appear lively, so change bait often. Set the bobber stop so the bait is about one foot off the bottom, the most active zone. 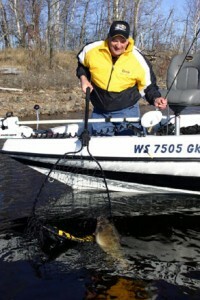 As you drift and cast a jig, set bobbers near the boat, including at least one directly in the cone of the electronics. Watch for signs of fish moving toward the bait, but balking before they take it. They might not like the size of the chub or it may be a sign to change to a fathead. If you catch one, toss a black buoy to avoid attention or better yet, mark a waypoint on the GPS. Drift beyond the spot before carefully and quietly dropping anchors to thoroughly fish the area. Where there was one walleye, there'll be more unless you make too much noise pounding an anchor on the bottom. If action slows, start the search again.